Youngblood Mineral Cosmetics are formulated with 100% natural minerals to improve the look and feel of your complexion. This professional line of mineral makeup is designed to provide natural-looking coverage while allowing skin to breathe and repair itself. Youngblood products are suitable for all ages and skin types — even mature, sensitive, and problem skin. The Youngblood story began when its founder, Pauline Youngblood Soli, developed her first products for patients recovering from intensive medical skin procedures, such as chemical peels and surgery. Today, Youngblood's luxurious formulations, precise milling process, upscale image, and chic packaging continue to propel the brand’s success and uphold its reputation. 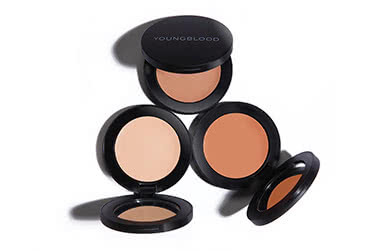 The Youngblood foundation line includes loose powder, pressed powder, liquid, crème powder, and other formulations. Each is available in a wide array of colours, so you can match your exact skin tone for the most natural look. All face makeup products are lightweight, breathable, non-comedogenic, long-lasting, and perspiration-proof. Bring a healthy-looking glow to your cheeks with blushes from Youngblood. Choose the convenient pressed mineral blush, luxurious crème blush, or classic crushed mineral blush. Complete your makeup with nonirritating eye makeup, lipsticks, and lip glosses. To get the best results, apply your Youngblood makeup with the brand's line of professional-grade brushes, tools, and accessories. Youngblood Mineral Makeup: What is Mineral Makeup? Oh my goodness!!! This has got to be the best liquid eyeliner I have ever used. It stays on all day long but is easy to remove. I will be buying this again and again!! This is the first concealer I have used that actually sticks to my skin. With other concealers I have found that I needed to really cake them on and the light spot would be obvious, if I didn't cake on the concealer, then it would rub off when I applied foundation on top of it. With this concealer I can use it under and over my foundation and it stays in place. The packaging is also great. This mineral foundation feels lovely on my skin. I set it with the hi-definition hydrating mineral powder.